A clone is an organism that is descended from, and genetically identical to, a single common ancestor. Animals can be cloned by embryo splitting or nuclear transfer. 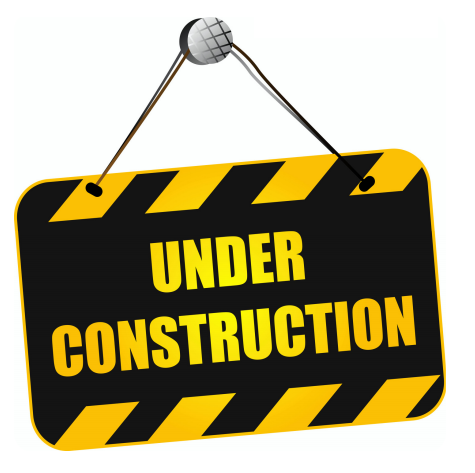 Embryo splitting involves bisecting the multicellular embryo at an early stage of development to generate "twins". This type of cloning occurs naturally and has also been performed in the laboratory with a number of animal species. Cloning can also be achieved by nuclear transfer where the genetic material from one cell is placed into a "recipient" unfertilized egg that has had its genetic material removed by a process called enucleation. The first mammals were cloned via nuclear transfer during the early 1980s, almost 30 years after the initial successful experiments with frogs . Numerous mammalian species have been cloned from cells of preimplantation embryos: namely mice, rats, rabbits, pigs, goats, sheep, cattle and even two rhesus monkeys. Dolly the sheep was the first animal to be cloned via nuclear transfer from a cultured adult cell in 1996. Since then, a diverse range of adult tissues have been successfully cloned in a variety of species including cattle, mice, pigs, cats, rabbits, goats, and zebrafish. The proportion of adult cell nuclei to develop into live offspring after transfer into an enucleated egg is very low. High rates of abortion have been observed at various stages of pregnancy after placement of the eggs containing the adult cell nuclei into recipient animals . Various abnormalities have been observed in cloned cows and mice after birth and this has been found to be somewhat dependent on the type of tissue that originated the nuclei used to make the clone. The reasons for the low efficiency of cloning by nuclear transfer are currently under investigation but it is thought that it may be related to insufficient nuclear reprogramming as the cloned nuclei goes from directing the production of an adult somatic cell to directing the production of a whole new embryo. Cloning offers the opportunity to make transgenic animals from cultured cells that have been genetically engineered . 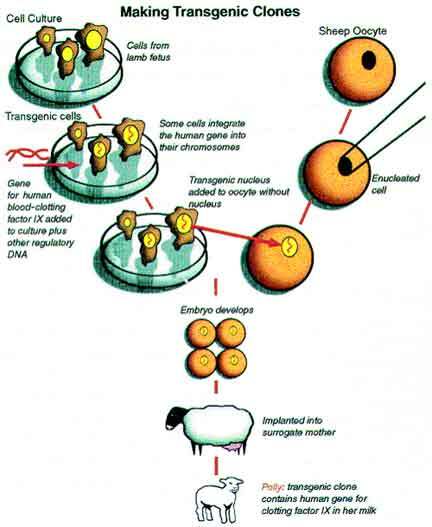 The first genetically engineered or transgenic mammalian clones were sheep born in 1997 carrying the coding sequences for human clotting factor IX, which is an important therapeutic for hemophiliacs. One of these transgenic sheep, Polly, expressed this protein in her milk . Cloning may also be useful for the preservation of rare and endangered species. In human therapeutics, patients may be able to clone their own nuclei to make healthy tissue that could be used to replace diseased tissue without the risk of immunological rejection. Making Genetically Engineered Clones (Data from Schnieke et al., 1997; Figure from De Berardino, 2001). Fetal cells in culture were transfected with a DNA sequence containing a selectable marker (neomycin resistance), the human gene for clotting factor IX, and a regulatory sequence to direct the gene to function only in the mammary gland. Following selection for neomycin resistance, nucleus from surviving cells were each transferred to an enucleated egg. Of the three transgenic clones born, one named POLLY survived and later secreted human clotting factor in her milk. Polly is the first transgenic mammalian clone. 1. Briggs,R, King,TJ: Transplantation of living nuclei from blastula cells into enucleated frogs' eggs. Proc.Natl.Acad.Sci.U.S.A 39: 455-463 (1952). 2. Meng,L, Ely,JJ, Stouffer,RL, Wolf,DP: Rhesus monkeys produced by nuclear transfer. Biol Reprod 57: 454-459 (1997). 3. Wilmut,I, Schnieke,AE, McWhir,J, Kind,AJ, Campbell,KH: Viable offspring derived from fetal and adult mammalian cells. Nature 385: 810-813 (1997). 4. Galli,C, Duchi,R, Moor,RM, Lazzari,G: Mammalian leukocytes contain all of the genetic information necessary for the development of a new individual. Cloning 1: 161-170 (1999). 5. Hill,JR, Burghardt,RC, Jones,K, Long,CR, Looney,CR, Shin,T, Spencer,TE, Thompson,JA, Winger,QA, Westhusin,ME: Evidence for placental abnormality as the major cause of mortality in first-trimester somatic cell cloned bovine fetuses. Biol Reprod 63: 1787-1794 (2000). 6. Kato,Y, Tani,T, Sotomaru,Y, Kurokawa,K, Kato,J, Doguchi,H, Yasue,H, Tsunoda,Y: Eight calves cloned from somatic cells of a single adult. Science 282: 2095-2098 (1998). 7. Kubota,C, Yamakuchi,H, Todoroki,J, Mizoshita,K, Tabara,N, Barber,M, Yang,X: Six cloned calves produced from adult fibroblast cells after long-term culture. Proc.Natl.Acad.Sci.U.S.A 97: 990-995 (2000). 8. Shiga,K, Fujita,T, Hirose,K, Sasae,Y, Nagai,T: Production of calves by transfer of nuclei from cultured somatic cells obtained from Japanese black bulls. Theriogenology 52: 527-535 (1999). 9. Wells,DN, Misica,PM, Tervit,HR: Production of cloned calves following nuclear transfer with cultured adult mural granulosa cells. Biol Reprod 60: 996-1005 (1999). 10. Zakhartchenko,V, Alberio,R, Stojkovic,M, Prelle,K, Schernthaner,W, Stojkovic,P, Wenigerkind,H, Wanke,R, Duchler,M, Steinborn,R, Mueller,M, Brem,G, Wolf,E: Adult cloning in cattle: potential of nuclei from a permanent cell line and from primary cultures. Mol.Reprod Dev. 54: 264-272 (1999). 11. Ogura,A, Inoue,K, Ogonuki,N, Noguchi,A, Takano,K, Nagano,R, Suzuki,O, Lee,J, Ishino,F, Matsuda,J: Production of male cloned mice from fresh, cultured, and cryopreserved immature Sertoli cells. Biol Reprod 62: 1579-1584 (2000). 12. Wakayama,T, Perry,AC, Zuccotti,M, Johnson,KR, Yanagimachi,R: Full-term development of mice from enucleated oocytes injected with cumulus cell nuclei. Nature 394: 369-374 (1998). 13. Wakayama,T, Yanagimachi,R: Cloning of male mice from adult tail-tip cells. Nat.Genet. 22: 127-128 (1999). 14. Polejaeva,IA, Chen,SH, Vaught,TD, Page,RL, Mullins,J, Ball,S, Dai,Y, Boone,J, Walker,S, Ayares,DL, Colman,A, Campbell,KH: Cloned pigs produced by nuclear transfer from adult somatic cells. Nature 407: 86-90 (2000). 15. Shin,T, Kraemer,D, Pryor,J, Liu,L, Rugila,J, Howe,L, Buck,S, Murphy,K, Lyons,L, Westhusin,M: A cat cloned by nuclear transplantation. Nature 415: 859 (2002). 16. Chesne,P, Adenot,PG, Viglietta,C, Baratte,M, Boulanger,L, Renard,JP: Cloned rabbits produced by nuclear transfer from adult somatic cells. Nature Biotechnology 20: 366-369 (2002). 17. Keefer,CL, Baldassarre,H, Keyston,R, Wang,B, Bhatia,B, Bilodeau,AS, Zhou,JF, Leduc,M, Downey,BR, Lazaris,A, Karatzas,CN: Generation of dwarf goat (Capra hircus) clones following nuclear transfer with transfected and nontransfected fetal fibroblasts and in vitro-matured oocytes. Biol Reprod 64: 849-856 (2001). 18. Lee,KY, Huang,HG, Ju,BS, Yang,ZG, Lin,S: Cloned zebrafish by nuclear transfer from long-term-cultured cells. Nature Biotechnology 20: 795-799 (2002). 19. Tsunoda,Y, Kato,Y: Recent progress and problems in animal cloning. Differentiation 69: 158-161 (2002). 20. Di Berardino,MA: Animal cloning--the route to new genomics in agriculture and medicine. Differentiation 68: 67-83 (2001). 21. 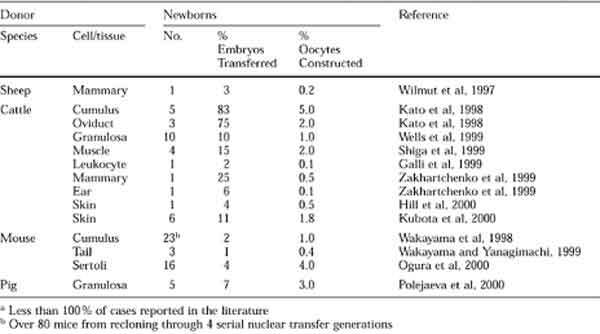 Schnieke,AE, Kind,AJ, Ritchie,WA, Mycock,K, Scott,AR, Ritchie,M, Wilmut,I, Colman,A, Campbell,KH: Human factor IX transgenic sheep produced by transfer of nuclei from transfected fetal fibroblasts. Science 278: 2130-2133 (1997). 22. Lanza,RP, Cibelli,JB, Diaz,F, Moraes,CT, Farin,PW, Farin,CE, Hammer.C.J., West,MD, Damiani,P: Cloning of an endangered species (Bos gaurus) using interspecies nuclear transfer. Cloning 2: 79-90 (2000).